Since graduating from Central Saint Martins in 2002, the vivid imagination of British illustrator and set designer Gary Card has given birth to the most fantastical flights of fancy, each one studiously brought to life through his unwavering tenacity and unending enthusiasm. To namecheck just a few of his achievements, he’s created shop interiors for Cos and LN-CC, shop windows for Stella McCartney and Liberty of London, extraordinary set designs for Dazed and Confused and T Magazine, numerous headdresses for Lady Gaga and Comme des Garçons as well as hundreds of brilliant artworks and illustrations. 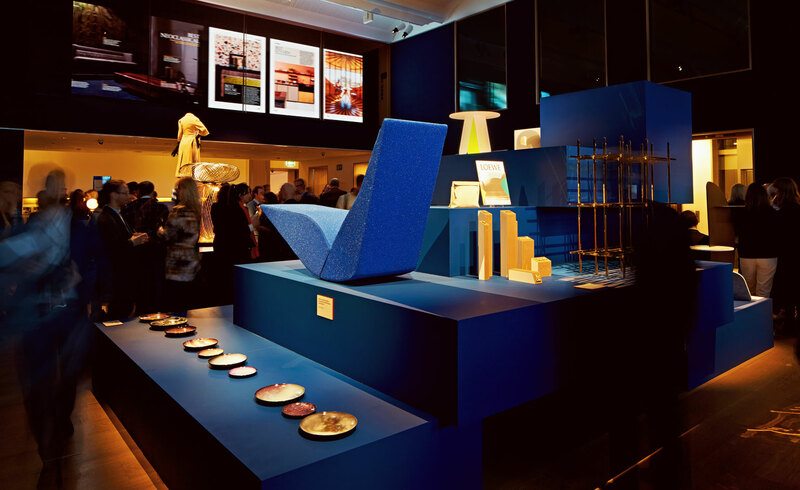 The latest addition to this lengthy list of commissions is the exhibition design for our very own Design Awards, hosted at London auction house Bonhams, which saw the designer build a series of towering multi-tiered pyramids out of intersecting brilliant blocks in our bespoke blue. Wallpaper*: What was the brief and how did you respond to it? Gary Card: Sarah [Douglas, Wallpaper’s creative director] approached me with the most perfect open brief. I think it was ’design the Design Awards’. The step plinth concept was conjured up with Sarah at a bar in Clerkenwell, drawn on napkin in fact - all the best ideas start on napkins don’t they? I said, ’How about a Mayan pyramid plinth system?’ - that was the initial impetus. W*: How did you want visitors to feel when entering the space? GC: Immediate visual impact is always important so I wanted to design something with an impressive sense of scale that inhabited the space completely. Luckily the Bonhams exhibition space was very easy to work with as it already had a warm, luxurious atmosphere to it - my job was to make something that was completely in tune with that space. I let the architecture of the space inform the design. W*: You work across a broad spectrum, from fashion to sculpture, is your starting point for a project always the same? GC: I always start with what the project needs questioning: what are the most important factors that we need to fulfill? At the same time I always design big and adventurous knowing we’ll have to scale down. Its important for me to get excited about a design from the get-go. A lot of the time what I’m designing is either logistically impossible or far too expensive to produce but its important to start by saying ’what if...?’. W*: The Design Awards encompass a wide variety of design disciplines. Was it challenging to create a set that catered to each of the categories? GC: In short, no. I had faith that all the pieces would start to create their own logic together. One of the first ideas that came to mind was to make a centralised installation, almost like an editorial still-life. I wanted to bring the pieces together into one cohesive form and I liked the idea of all these different designs working together. Having everything on different levels was key. Some of the pieces had interesting juxtapositions between each other, things that wouldn’t normally sit together. My goal was to create something that brought these different things together in an interesting yet harmonious way. W*: Your design is quite restrained in comparison to some of your other works - was this deliberate? GC: It’s about giving the project what it needs. Sometimes a project needs to sing and dance, but a lot of the time it’s about making something that simply supports the project. It was important to me to make something that was visually interesting but never overshadowed the pieces on display - it would have been inappropriate to design a display system that was more inventive than the work we were exhibiting.